MaxBioticTM contains highly concentrated, stable colonies of “friendly” bacteria strains, supplied in convenient tablets with controlled release delivery. These human probiotic strains contribute to overall health by inhibiting pathogens such as E.Coli and Candida albicans, maintaining gut barrier integrity, aiding food digestion, and supporting immune function. This NEW formulation, resistant to stomach acids and bile salts, mirrors the digestive system and provides benefits throughout the entire intestinal tract with no ill effects for the vast majority of patients. 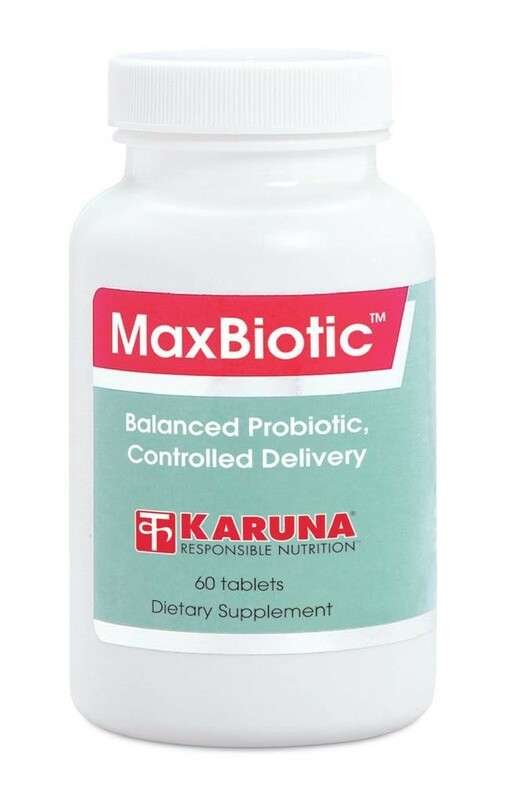 Though MaxBioticTM is carefully manufactured to support room temperature shelf life, Karuna recommends refrigeration for optimal longer-term potency and viability. An exceptional probiotic choice enhanced by affordable patient pricing! Suggested use for adults: 1-2 tablets daily, or as directed by your health care practitioner.